The Brighter House. Kim Garcia. White Pine Press. Buffalo, New York. 2016. Today's book of poetry is a bit weak when it comes to his mythology, its history, characters and so on. Kim Garcia's whippersnapper The Brighter House invests fairly heavily in legend, the deep mysteries of our collective past. So how does Garcia manage to make The Brighter House feel so current, urgent, how does Kim Garcia make us care? We care because we can identify with Garcia's demons, we understand that the monster dying in the hospital bed is still a father. We know what that Blackdog anger does to perception. Garcia has the anger but these poems are too smart to resort to simple revenge, vengeance. Kim Garcia finds beauty even on the starkest panorama. She also knows that sometimes beauty has a price. Kathryn, our Jr. Editor, got the ball rolling. Once in gear Kim Garcia's The Brighter House did all the hard work. Whether Garcia is imagining/wishing into place her sister, appearing as a vengeful matador or imagining her father as God: Garcia invites the reader into her somewhat magical world with language. Garcia peoples these poems with characters who scrape up against the smooth edges of your soul. They know where you are tender. looking in on me through the car window. while my mother went for my prescription. a ticklish insect-footed sensation on my skin. I stared back. Probably I flirted. swallowed whatever came in the capsules. I was pale, and my eyes were almost black. My mother came out of the drugstore. to two black men below. They spoke. I was useless to her. A few days later he came with a load. with my mother. Then he took me to the drive-in. all day in Texas heat--for what? not knowing what she was beginning or ending. like a real date would have done. along my thick, fifteen year old waist. for a full grown man. My mother was in bed. No. broke suddenly into a run and return. to a steady tap of beetles against the yellow light. Moths folded flat against the dark siding. and ask, "What did you do?" and years from now. Children changed. and look at you like a stranger. Dreamland. There is an ethereal sense to these poems, they sometimes feel too light, almost too perfect to hold together but they do. Gossamer usually refers to something delicate or insubstantial yet Garcia's gossamer poems pack power. In The Brighter House Kim Garcia's power comes from her "felted hammer on razored strings." These dignified and almost quiet poems carry the big knockout punch. When Garcia ties up the loose ends these poems are wicked sharp. Garcia is the proverbial iron fist in the velvet glove. ready for the next ting, saving up. for it to enter. Yes, I'm saying yes. you can tell me everything now. All of it. The Brighter House took Today's book of poetry in with the first poem and jerked me around like a fish on a hook until Garcia was finished with me and threw me back in the water. I'm back blowing bubbles in the weeds, but for a few moments, I was out of my element, I had a clear vision of another universe. Kim Garcia is the author of The Brighter House, winner of the 2015 White Pine Press Poetry Prize, DRONE, winner of the 2015 Backwaters Prize, and Madonna Magdalene, released by Turning Point Books in 2006. Her chapbook Tales of the Sisters won the 2015 Sow’s Ear Poetry Review Chapbook Contest. Her poems have appeared in such journals as Crab Orchard Review, Crazyhorse, Mississippi Review, Nimrod and Subtropics, and her work has been featured on The Writer’s Almanac. Recipient of the 2014 Lynda Hull Memorial Prize, an AWP Intro Writing Award, a Hambidge Fellowship and an Oregon Individual Artist Grant, Garcia teaches creative writing at Boston College. How does she do it! In The Brighter House, Kim Garcia speaks in the language of delicate and mesmerizing touch with phrases like "feather-brush antennae" and "ticklish insect-footed sensation" and "wished-for snow" without ever falling into precious sentimentality. Over and again, these poems mount to harsh and cold violences that speak to the intricacies of the soul in a gorgeous way that leaves the reader feeling bruised--as in pressed upon--but not bloody. This is a brilliant book of first-rate artistry. 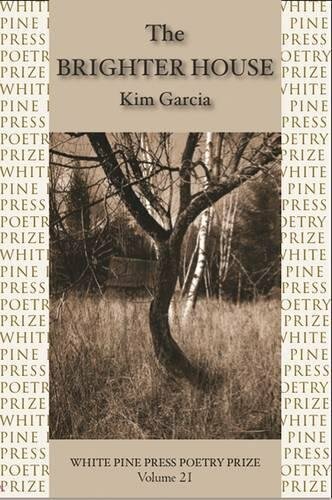 Rainer Maria Rilke said that there are two inexhaustible sources for poetry, childhood and dreams, and Kim Garcia drinks deeply from both wells in these magical, spooky, riveting, and mysterious poems. This collection is a powerful exploration of the mythological roots of a home, a father, and sisters. The author cleans away that which obscures with the miracle of lyricism. We are lost in the stark beauty of the journey. Then, we are found.